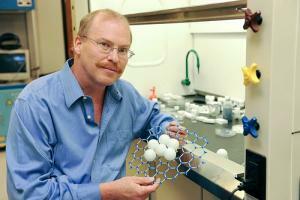 Dr. Rodney S. Ruoff, a physical chemist from The University of Texas, has been awarded a $1 million grant from the W.M. Keck Foundation to lead a 3-year research on graphene. The research goal is to enable the large-scale creation and production of graphene and ultra thin graphite. The team plans to work in several phases to address the larger challenges facing scalable graphene. For example, when graphene is cut it typically loses its conductivity. Ruoff and team will study ways to reverse this loss as well as construct a new graphene reactor that will help identify pathways for scale-up. The total cost of the research project is more than $1.5 million, with the Keck Foundation funding $1 million and the university supporting the remainder.